Welcome to Ramadan, this column is about the politics, traditions and the spirit of Ramadan. Like a mother who wants her children to live well, like a teacher who wants his students to do well, and like a chef who wants his patrons to enjoy his food…. God wants every one of his creation to live in harmony and do well. No one is deprived of God’s love; he has reached every human through a peace maker, messenger, prophet, reformer or simply a wise man or a good friend that brings sense to living. The creator offers a variety of guidance to the mankind, no matter where you live, the guidance is there, the guidance that leads to live in peace, and without fear of the other. Religion is one such instrument that God guides us through, and there are many of them, at least 250 traditions including a dozen major ones. Each tradition does well for the believer in bringing peace to oneself. Today, the one tradition I am talking about is Islam, and one of its beautiful aspects that helps build cohesive societies. Welcome to Ramadan, it begins on Friday the 20th of August, 2012. It is the month of fasting, a month of learning about others, connecting with others, developing empathy with fellow beings and above all reaching new heights in piety and spirituality, Taqwa as it is called. It is to become closer to God and emulate his qualities of unselfishness, forgiveness and love. It is a month of practicing service to fellow beings and developing self discipline to learn to live they way we want, and being conscious of every moment of the day for 30 days. I am working on an article on Ramadan, which I stopped, instead to write about Michelle Bachman and her tantrums which shall appear at Huffington post tomorrow. Meanwhile here are a few things I have written. Politics plays a crucial role in our Temples, Synagogues or Churches, Mosques are no different. A few scientifically-inclined-Muslims have adopted NASA’s calculations believed to be precise. However, four different traditions are operating concurrently; i) Strictly Calendar, ii) NASA and iii) Sighting with bare eyes and iv) sighting by others in the community. The spiritual masters have captured the human gravity towards rituals and have molded it with the art and science of self-discipline in their respective religions. The noble purpose of each one of them was to bring a balance in our lives and a balance with our environment. Quraan says, had God willed, he would have made every one of us alike - then he says, he chose to make us into different tribes and nations from the same couple (or the same source). Then he goes on to challenge us to know each other - he knows that our conflicts stem from not knowing each other, and living with misinformation about others, when we know each other, conflicts fade and solutions will emerge. Every religion means peace and Justice and that is acceptable to God. He says, you need not worry who you are, as long as you take care of your neighbor, I will recompense you. Each one of us is responsible for our Karma. He concludes ( Quraan 49:13) that the best among us is the one who knows each other, learns about each other and respects each other. If we take the time, to learn, every religion is out there to bring goodness to humanity. Be good to yourselves and every one around you. Happy Ramadan. 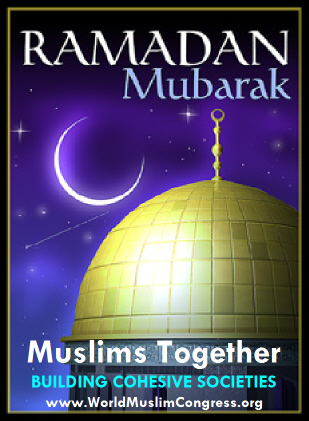 Mike Ghouse is committed to nurturing the pluralistic values of Islam and welcomes everyone to explore Www.worldMuslimCongress.org and several related sites listed at: http://mikeghouse.net/Sites.MuslimsTogether.IslamTogetherFoundation.com.MikeGhouse.asp . The site www.MikeGhouse.net lists everything about Mike.